beds for sitting up and reading or watching TV/DVD. The Starboard cabin has a double berth and the Port cabin two side by side twin beds each with a private head and shower. 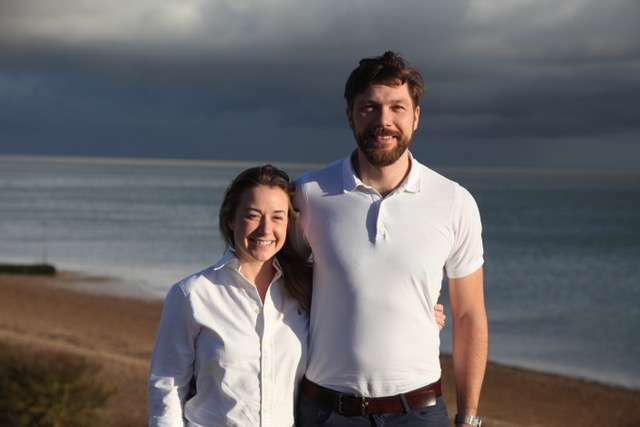 Owen and Pamela have a genuine love for sailing and waterborne activities. They are both highly experienced, commercially endorsed Yachtmasters and enjoy sharing their nautical passion with the owners and guests. Midnight’s captain Owen grew up in Australia lifeguarding, sailing, surfing, free diving and skiing. He is a Padi divemaster, jetski and water sports instructor. He has worked aboard a variety of vessels large and small and has logged seas miles throughout the Maldives, Australia, Thailand, Singapore, the Mediterranean, the Caribbean and the Antarctic. Pam grew up in Ireland sailing dinghies and is an avid surfer, sailing coach, diver, swimmer and kite boarder. Pam moved to Sydney in her early twenties where as race crew her results included winning Hamilton Island Race Week and a podium result in the Sydney – Hobart Race. Her love of adventure, travel and the open ocean have driven her career in yachting. Owen and Pam have proven success on the water as a team and thrive on keeping Midnight in pristine condition. Midnight’s chef Joni completes the team and her passion for exceeding expectation in the galley has consistently delighted our guests through the 2018 summer season. With a high quality varied menu, tailored to guest’s requirements, Joni’s ability to speak Italian, Spanish and French is useful when sourcing the best fresh local provisions. An expert in gluten free baking and interested in vegan cuisine, Joni would be delighted to discuss your personal preferences, whatever your heart desires! The crew aboard Midnight take safety seriously and understand the expectations of guests. Their aim is to make every day a special pleasure. Great sailing or relaxing, our guests set the pace, while first class on board service is delivered with big smiles and energy.